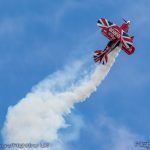 The Torbay Airshow returned for its third edition in 2018 and once again opened the summer season of seaside airshows. In 2017 the show attracted 150,000 spectators to the Devon coastline and the organisers hoped to beat that figure this year. 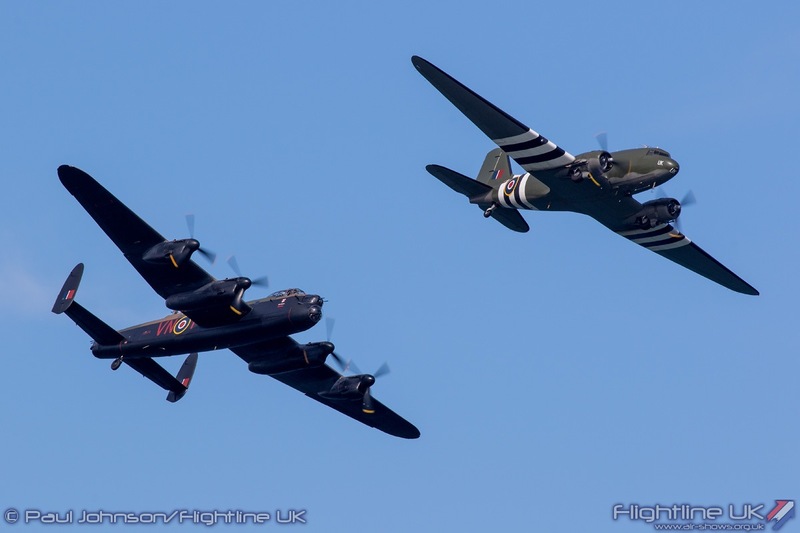 As in previous years, the show attracted almost all the RAF’s displays which included the Battle of Britain Memorial Flight who debuted their ‘Trenchard Formation” at the event. The Torbay Airshow has become a firm favourite on the airshow calendar. 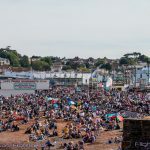 The town of Paignton hosts the event and looks out over Tor Bay with the town of Torquay to the north and Berry Head to the south creating a picturesque natural amphitheatre for the flying display. It is also one of few major aviation events in the far south-west now that Dawlish and Culdrose have slipped off the calendar. Paighton Green is the central hub for the show just behind the promenade. The UK armed forces were well represented amongst the usual assortment of traders with contributions from the Royal Air Force, Royal Navy and British Army. The weather for the 2018 could not have been better with blue skies on both days and just a few scattered white clouds on Saturday. The weather itself made for quite a spectacle on Saturday morning with some low clouds blowing off the sea and flowing up the headlands to the north prior to the flying. The popularity of the event continues to grow and Paighton Green and beach were full of people all day enjoying the sunshine. The crowd actually extends much further than the main show site and there were also large crowds all around the Bay. The flying display was a three and half hour mix of airshow favourites from the UK and for the first time this year included a contribution from Europe. The display opened with Team Raven with their five-ship mix of a single Vans RV4 and four RV8s. Raven’s display was a nice mix of formation a solo aerobatics than kept the action in front of the crowd throughout their display with no gaps and some very elegant figures. More formation aerobatics came from the Blades Aerobatic Team. Torbay was the first public display for the team which has seen many changes over the winter. Most noticeable is their very stylish and patriotic colour scheme which matches the branding on the team’s Edge 540 flown by Ben Murphy in the Red Bull Air Race. There are also some new faces on the team with former Red Arrows pilot James MacMillan and UK unlimited aerobatic champion Gerald Cooper joining the team. Andy Evans has taken over as Blades 1 and at Torbay was joined by Kirsty Murphy as Blade 3 and Gerald Cooper as Blade 4. They have revamped the display too with some new formations, breaks and some superb solo flying from Gerald. Rich Goodwin provided the solo aerobatic thrills in his Pitts S-2S Special “Muscle Biplane.” Rich made some eye-catching knife-edge passes along the seafront as well his stunning routine of unlimited aerobatics. 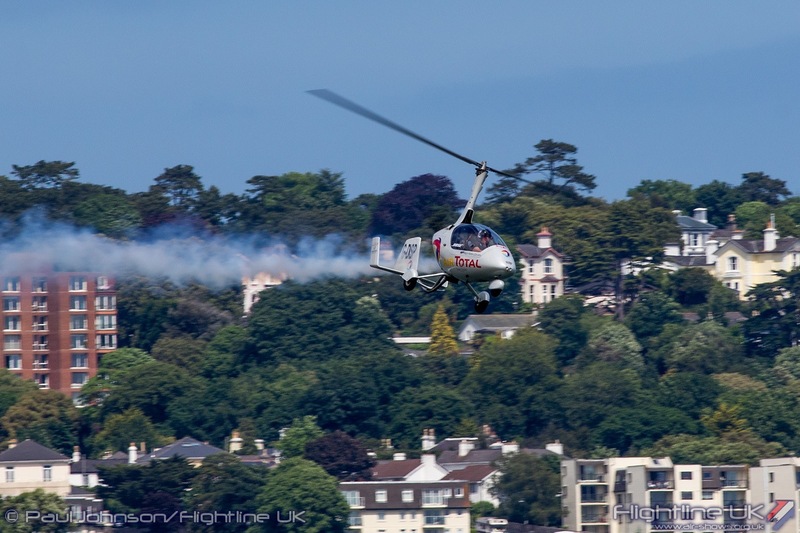 One of the most engaging displays of the afternoon came from Peter Troy-Davies in his AutoGyro Calidus. Despite being the smallest aircraft in the show, Peter is allowed to fly closer to the crowd and can interact with them waving in coloured gloves from the cockpit. The Calidus is also a very agile machine capable of some very tight turns and steep climbs. 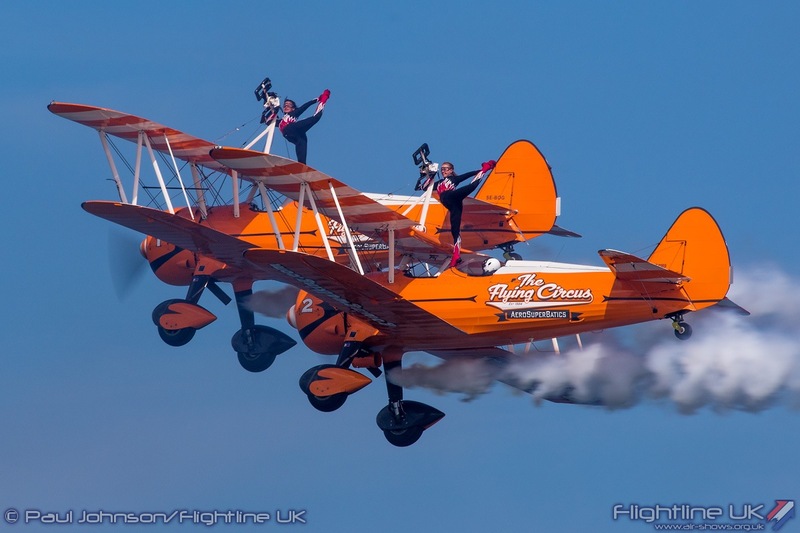 Saturday’s display also saw some extra colour and smoke from the AeroSuperBatics Wingwalkers appear in their Flying Circus marked Boeing Stearman. The British Army’s Tigers Freefall Parachute Display Team provided a break from all the aircraft displays mid-way through each day’s displays. Drawn from the Princess of Wales Royal Regiment, the team are always very enthusiastic supporters of each event they attend. 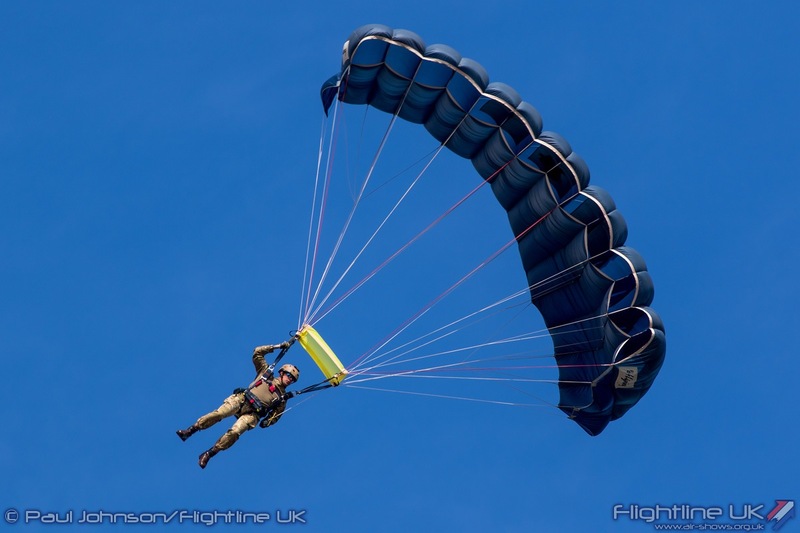 For Torbay, the jumped on to the beach demonstrating freefall and canopy formation work. In the Royal Air Force centenary year, it was good to see a good number of historic aircraft take part in the flying. One item with a strong local connection was the Supermarine Spitfire IX RR232 ‘City of Exeter” flown by Matt Jones. Operated by the Boultbee Flight Academy at Goodwood Aerodrome, the aircraft carries the “City of Exeter” motif to mark an original Spitfire which was presented to the Royal Air Force at Goodwood (then known as RAF Westhampnett) over 75 years ago as a result of local fundraising by the people of Exeter. A late addition to the flying display was the Aircraft Restoration Company’s beautiful Bristol Blenheim 1F which replaced the Norwegian Air Force Historical Squadron’s Vampire pair. John Romain flew some lovely sweeping passes showing the top and under-sides of this unique airworthy example of Blenheim. The historic line-up also included a couple of cold war classics. Mark Petrie and his BAC Strikemaster Mk82a have become firm favourites at Torbay. This year sees G-SOAF sporting a new look as Mark has repainted the aircraft into the authentic Royal Air Force of Oman camouflage scheme initially worn by their Strikemasters when they entered service. 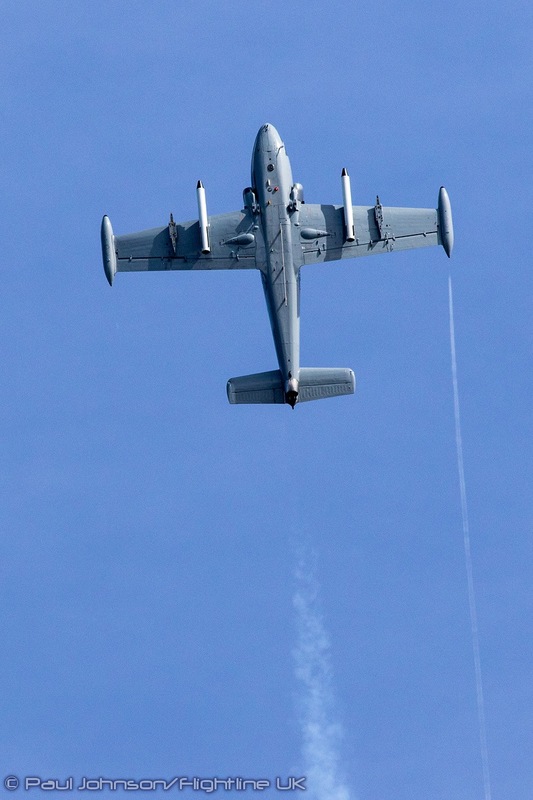 Joining the Strikemaster in the display was the North American OV-10B Bronco flown by Tony de Bruyn. This was the first time the Bronco had been to Torbay and indeed the first time a European based display act had appeared at the show. 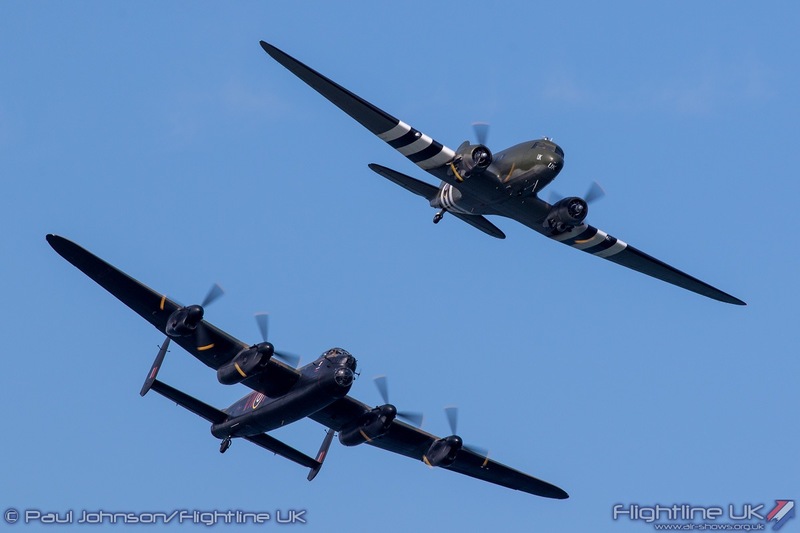 However, the stars of the historic line-up came from the Royal Air Force Battle of Britain Memorial Flight with a duo display by the Avro Lancaster B1 and Douglas Dakota III. For the Royal Air Force centenary display season, the flight has put together a new combination display called ‘Trenchard Formation.’ Sadly the fighters were unable to make Torbay but the show did see the first public display by the duo display by ‘heavies.’ Pilots Seb Davey and Tim Dunlop have really worked up an impressive display of close formation flying which see the Dakota lead the Lancaster for a number of passes before an on-crowd break. The formation will be seen at a number of key events during the summer and is sure to be one of the highlights of the RAF100 year. On top of the BBMF display, the Royal Air Force sent nearly all their display teams to Torbay. 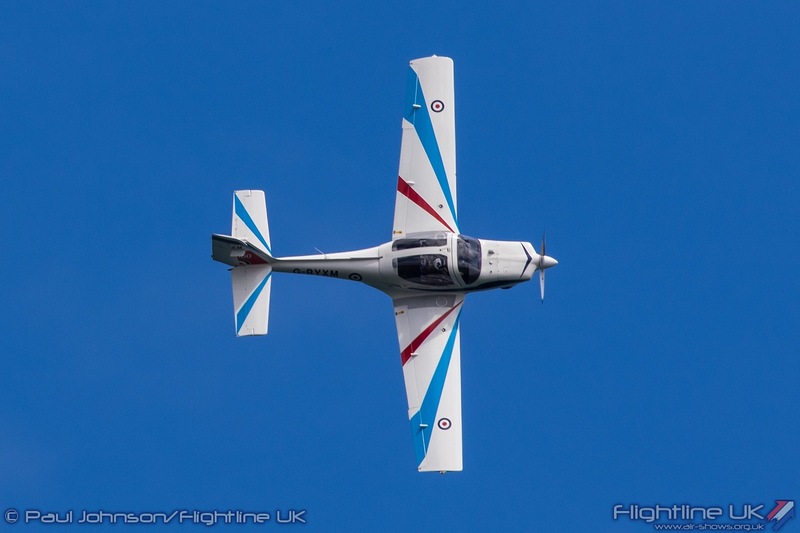 The Grob Tutor T1 solo display had its first weekend of public displays at Torbay. The pilot for 2018 is Flt Lt Andy Sell who currently serves on the standards flight of 115(R) Squadron. Andy is an experienced display pilot having been a display captain on the Battle of Britain Memorial Flight flying the Lancaster and Dakota. Andy’s display was certainly very energetic one with a stream of different aerobatic manoeuvres before a final flourish with a low pass to complete his sequence. Joining the Tutor were a pair of frontline RAF aircraft. Sunday saw the Boeing Chinook HC6 put through its paces by Flt Lt Stu Kynaston and the crew from the Chinook Display Team from RAF Odiham. The Eurofighter Typhoon FGR4 however appeared on both days and concluded the flying displays on each day. It was just the second public display of the year for the 2018 display pilot Flt Lt Jim Peterson. 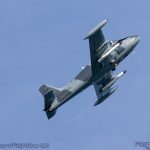 Jim was able to take advantage of clear skies to perform his first “full” display of the year over Torbay which highlights the impressive performance of the jet at low and high speeds. The highlight of the show for many though was the RAF Aerobatic Team , the Red Arrows. Torbay was the team’s first public display of the year and the first under the leadership of the new Red 1, Squadron Leader Martin Pert. The work-up for the RAF100 year has had its highs and lows for the team. The accident at RAF Valley involving Flt Lt David Stark and the tragic loss of Corporal Jonathan Bayliss was a tough time for the team. They however regrouped and were able to maintain the nine-ship by recruiting back to the team Squadron Leader Mike Ling to take over the Red 3 position. That makes Mike easily the longest serving member of the team amassing 9 seasons as Red 3, Red 7, Red 6 and of course Red 10. What is really good to see this year is a new display with some impressive new formations and new takes on some old favourites. In honour of the RAF’s latest frontline strike aircraft, there is a new formation called ‘Lightning’ and a new synchro opposition pass called the vice-versa. Torbay is a great venue for a flying display with a superb backdrop to watch the flying display against and a nice compact showground area. At times the displays may be a little distant for some tastes due to the topography of Tor Bay but it is always very entertaining. It is great to see the venue gaining popularity and we hope that the Torbay Airshow continues for many years to come.